The Crossrail project, an underground railway tunnel, is designed to reduce traffic in London. But the project has also provided Britain's capital city with a view into its 8,000-year-old history. Jackie Keily is the curator of "The Archaeology of Crossrail" exhibition at the Museum of London Docklands. She says, "The great thing about the Crossrail project is that it's allowed us to basically sort of take a slice through London." The underground project to connect Heathrow airport to the financial district has unearthed over 10,000 artifacts. One of the highlights, Keily says, is a bronze medallion dating from the year 245 AD. During this time, southern Britain was ruled by the Romans. "It's a medallion that would have been given by the emperor to a high-ranking official, probably in Rome. And it's quite fascinating that it's travelled right across the Empire to be here in London." Another interesting find are Roman "hipposandals." These are metal shoes for pack animals. They were used for animals, such as oxen or horses, as they moved goods around the rain-covered streets of early-day London. 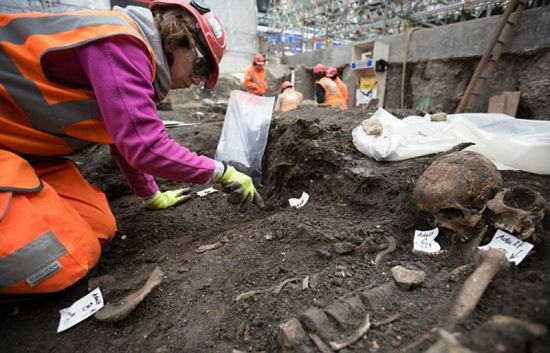 Hundreds of human skulls were also found beneath what is now the financial district of London. Did they belonged to the losers of gladiator battles at the nearby Roman amphitheater? One very unusual artifact was a skeleton of a woman with her head removed and placed between her leg bones. It is displayed as it was found, buried beneath what is now Liverpool Street station. The Crossrail also travels through several graveyards, many dating to major disease outbreaks, like the Black Death' plague of 1348. An estimated 1.5 million people died across Britain because of the plague. There are also lighter aspects of London life on display. A bowling ball was found in the moat of a sixteenth century house. Hundreds of leather shoes have also been unearthed. These are around 500 years old. According to Keily, the shoes connect people, in a way, to people in the past. "The earlier shoe at the very bottom has got this really long, elongated, pointed toe. Whereas the ones above are much more like the ones we imagine Henry the Eighth wearing, they've got these broad toes. So very fashionable shoes that Londoners were wearing." Despite the detailed archaeological work, construction of Crossrail remains on schedule. The first trains will take passengers through these tunnels in late 2018. London's subway, the world's first underground railway network, first opened in 1863. The store had quite an array of leather shoes in stock. After the collision, the bowling ball continues unaltered. 1.According to Keily, the shoes connect people, in a way, to people in the past. 2.Hundreds of human skulls were also found beneath what is now the financial district of London. First Canadian Place is the focal point of the country's busiest business and financial district. We met in a bar in the financial district.